This feature gives you the ability to assign a “User-Defined Code” in the COP line item screen for special tracking purposes. 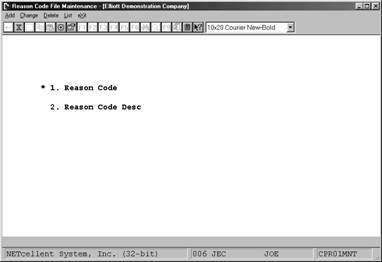 In the Order Line Item Entry Screen, the system will prompt you to enter a User-Defined Code. You can either press enter to skip this field or enter a valid code (F7 search key is provided). 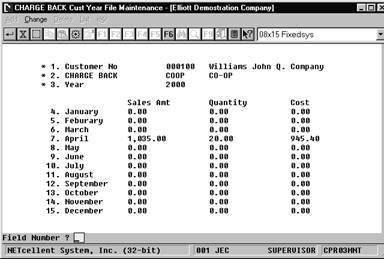 When posting invoices to A/R, the system will update COP Invoice History, User Defined Code/Year, and Customer User Defined Code/Year Files. This information can be used later for reporting and analysis purposes. We have also provided an initialize, export, import, and rebuild function for these three files. Select User Defined Code File from the COP Maintenance Menu. Before you can use this function, it must be setup as per the Global Setup documentation. The screen that appears is where you define your codes, as well as the change, delete, and list functions. Some examples of user-defined codes are COOP Advertising, Damaged Goods, Defective Merchandise, Direct Mail Sales, Telemarketing Sales, etc. With careful planning and forethought to user-defined codes, these codes can be powerful reporting and analytical tools. 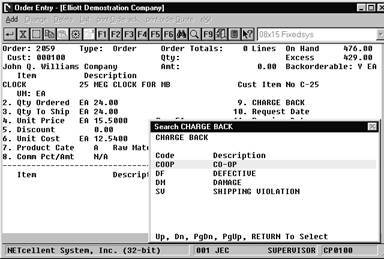 After defining your “Charge Back User Defined Codes” (Charge Back is just a literal expression) and you enter an order type as defined in the setup, the line item screen will display a “CHARGE BACK” for your input. At this field, we have provided an F7 key function to search for your codes. After posting invoices to A/R, the system will update the User-Defined Code/Year file and the Customer User Defined Code/Year file. These are the two files used for reporting and analysis. The User-Defined Code/Year file is divided into 12-month buckets. It displays the Sales Amount, Quantity, and Cost. You can print a listing based on a “CHARGE BACK” (user-defined) range and year range. This information can be used as an analysis tool. To access this file: Customer Order Processing ® Yearly user defined file. 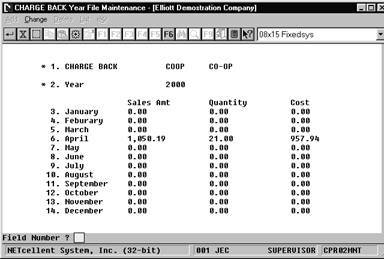 The Customer User-Defined Code/Year file is divided into 12- month buckets. This file is similar to the User-Defined Code/Year file. The only difference is that you can display information for a specific customer. It displays the Sales Amount, Quantity, and Cost. You can print a listing based on a customer range, “CHARGE BACK” (user-defined) range and year range. This information can be used as an analysis tool. To access this file: Customer Order Processing ® yearly cust user Def code.